A selection of published articles, by topic. Congress has extended the National Flood Insurance Program, which protects 5 million U.S. properties, through the end of this year’s hurricane season Nov. 30. But there is little movement toward the long-term reform experts say is desperately needed. Federal subsidies for rebuilding flooded properties, coupled with the rollback of standards for that rebuilding, create the illusion that cities and towns can continue to ignore flood risks without financial consequences. But a reckoning is coming, according to a new white paper. Are oil companies that drill for, process and distribute fossil fuels responsible for climate change, or does the blame fall on consumers who use these fuels as energy and release carbon dioxide emissions that warm the atmosphere? Does their use of the product ultimately make consumers, rather than the oil companies, responsible for sea level rise and melting glaciers? Coastal communities may have even less time to prepare for rising seas than previously thought, says a new study from the Union of Concerned Scientists. Heading into Tuesday’s open primary elections in California, the candidates for state attorney general have all been clear about where they stand on a potential state investigation into whether oil giant ExxonMobil misled the public about climate change, except one: the incumbent. The fossil fuel industry says local governments are telling courts they face staggering climate-related costs but are not disclosing those risks to potential municipal bond investors. Yet interviews with experts and a review of bond documents suggest this argument has little substance. Read more of my stories for Climate Liability News. 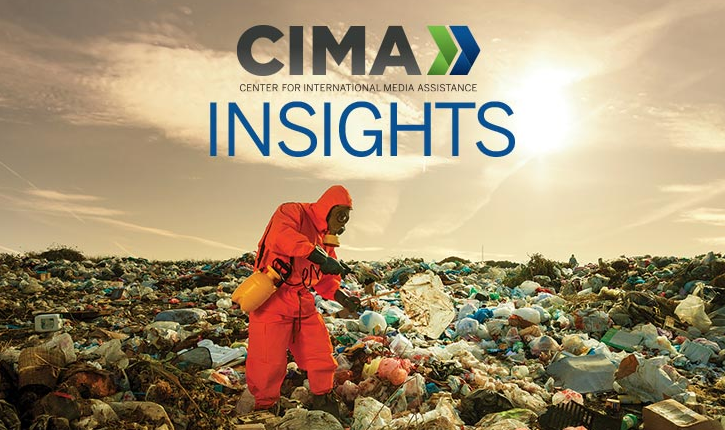 How media development organizations are helping improve the public’s understanding of climate change and other environmental issues by training reporters and citizens; supporting investigations; and creating innovative ways to gather information, present environmental data and engage the public. In Africa, where mobile news and digital innovation are growing but startup capital is too often scarce, innovators have a unique opportunity to help reinvent media. Are ABC’s new one-person foreign bureaus a model for covering the world in the digital age? The network launches a blog to scrutinize its news operation. Despite the Los Angeles Times’ fiasco, the interactive online tool holds promise for journalism. Squeezed for profits, newspapers send their staff film critics packing. Is this sound cost-cutting or a missed opportunity? AJR’s latest survey of the nation’s state capitols finds a dramatic decrease in the number of newspaper reporters covering state government full time. Digital news outlets are springing up to fill the breach. When will these efforts be enough to compensate for the loss of the newspaper watchdogs? What should news organizations do when a story comes under fire? Many newspapers are laying off the reporters who monitor the federal government from a local angle. The cost could be steep. Using hard copies of Maryland state government records, I created a database and analyzed it to report this story, which was a finalist for an Investigative Reporters and Editors Award.